Amis Cameron’s comment is not uncommon. I hear it often from well-meaning friends and fellow environmentalists. I respect their efforts to be responsible, but I am always amazed they don’t look at the environment in a more holistic way. The responsibility is on us to ask how our food is produced. Vegans may not eat meat, but they certainly consume animals. And their plants are often fertilized with manure from confined animal feeding operations. How’s that for irony? Further, vegans and vegetarians often believe that things don’t die to produce their food. This flies in the face of even the most basic understanding of the carbon cycle, aka the “life cycle.” If you are eating, you are consuming plants or animals that depended upon the deaths of past critters. As our ability to peer beneath the soil surface improves, we can see that even some of these critters have faces. Amis Cameron won’t eat a steak, but she depends upon manure to fertilize her plant-based foods, cattle intestines and tallow for her beauty products, life-saving vaccines and medicines, hides for her furniture upholstery, clothing and accessories, and fatty acids to hold the tires together on the fossil fuel hungry private jet. She, too, participates in the carbon cycle. And why is it acceptable for environmentalists to shun meat, but consume fish? Do they not know that our oceans are also suffering and we need to be aware of how fish are harvested if we are to protect the environment? According to the Monterey Bay Aquarium’s Seafood Watch, “Over the past five decades technology has allowed us to fish farther, deeper and more efficiently than ever before. Scientists estimate that we have removed as much as 90 percent of the large predatory fish such as shark, swordfish and cod from the world’s oceans. In 2003, the Pew Oceans Commission warned that the world’s oceans are in a state of “silent collapse,” threatening our food supply, marine economies, recreation and the natural legacy we leave our children.” Like cattle, fish need to be managed in a way that protects and nourishes the environment. Beef is one type of meat. Halibut and salmon are others. Alternative protein sources have environmental effects as well. 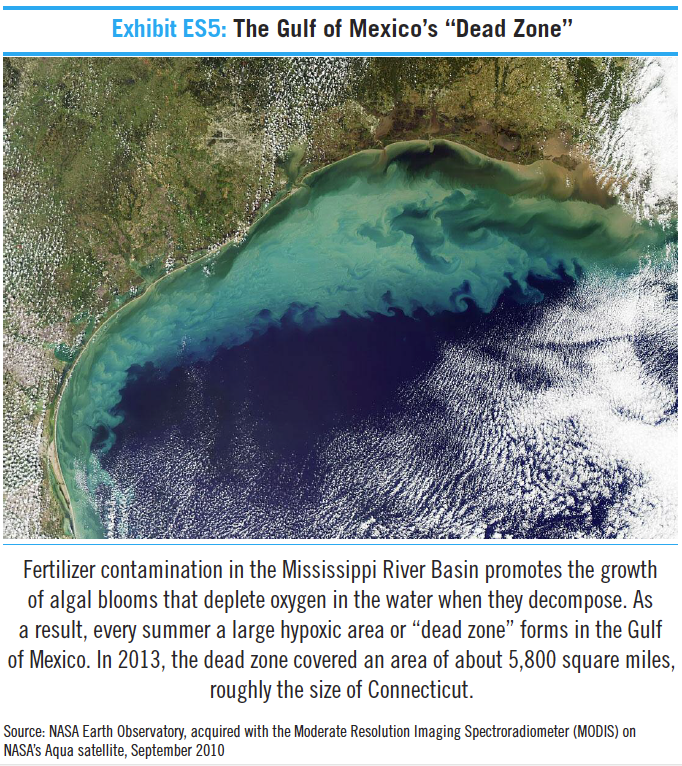 Industrial soybean production, required for every vegan’s Gardenburger, tofu, and glass of Silk soy milk, is responsible for the massive “Dead Zone” pollution in the Gulf of Mexico and deforestation in Latin America. Of course, there are responsibly sourced soybeans too. I wonder if most vegans ask how their soybeans are grown? It takes huge amounts of fossil fuels and GMO seeds to produce vast monocultures of soybeans stretching from Minnesota to Louisiana. There’s no party in that soil. I’d rather get my protein from the humble cow hosting the microbial Oktoberfest. It comes back to looking at life and our environment as a connected cycle, a system in which one action triggers another and so on. We’re all connected in more ways than we know. We had the pleasure last month of meeting Greg Roden and Stett Holbrook, two independent film makers working on a documentary about … food. I know, I know, maybe some of you are experiencing some “food fatigue” with all the recent books and documentaries about how our food is produced. Indeed, people like Michael Pollan and Alice Waters have raised awareness about our food. Films like Food Inc., and Fast Food Nation have prompted the question: “What is this made of?” These are good questions though, and, larger than just ourselves. The food we eat affects more than our own health. Depending on how it is produced, food can be a hindrance (CAFOs, large monocrops, and pesticides flowing to the Gulf of Mexico) or help (healthy watersheds, carbon-sucking, healthy grasslands, abundant oceans) to our planet. As a journalist, I was taught to write about all the sides of the story, offer an informed and balanced account to complex issues so readers can come to their own, educated conclusion. Food Forward does this by going beyond the problem of industrial food production and offering a way for everyone to participate in choices that are not only good for their bodies, but good for the planet. Here’s a note from Greg on how you can get involved. Hope to see you there! A special night of food, wine and inspiration at San Francisco’s new Radius restaurant is just a week away and there’s still time to save your seat at the table. We, the co-creators of the Food Forward documentary TV series, are holding a one-of-a kind fundraising dinner Aug. 3. KQED has agreed to present our show to a national PBS audience upon successful completion of our pilot episode. We’d love to have your support to help us get there. Chef Kelly Hughett is preparing a delicious menu of local foods that celebrate the flavors of late summer. The evening will also include wine pairings and gift bottles from premier local wineries that practice sustainable, organic or biodynamic winemaking including Burrell School Vineyards and Winery, Poetic Cellars, Sky Saddle Winery, Bonterra Vineyards, Robert Sinskey Vineyards, Thomas Fogarty Winery, and Loma Prieta Winery. Attendees will also receive an organic cotton Food Forward grocery bag loaded with hand-selected, premium products from local purveyors including Swanton Berrry Farm, Katz and Company, Point Reyes Cheese Co., Route 1 Farms, Miette and other delicious products. Check out yesterday’s great post on yesterday’s post on the excellent Grist.org! What: Fundraising dinner for Food Forward pilot episode on urban agriculture. When: 6 – 9 PM, Tuesday, August 3, 2010. Where: Radius Restaurant, 1123 Folsom (btw. 7th & 8th), San Francisco. Why: Let’s eat. Right. Now. In addition to a night of great food and wine, this dinner will include a screening of the new Food Forward trailer in HD. Guests will also have the opportunity to hear from some of the stars of our show and words of inspiration from environmental attorney Nicolette Hahn Niman, author of Righteous Porkchop and co-owner of BN Ranch in Bolinas, a farm she runs with husband and sustainable meat pioneer Bill Niman. Can’t make the dinner? You can still contribute today by donating securely via Pal Pal. Relaxing on the wooden front porch’s comfortable outdoor furniture, which overlooks the Golden Gate, it would be easy to enjoy even mediocre food here, but the menu doesn’t depend on the view for customers. We ordered the local oysters and grilled prawns, a perfect mid-day appetizer. Paired with an Anchor Steam beer and glass of Pinot Grigio, this is a local foodie’s dream. *Both the oysters and prawns are in the green “Good” column of my Seafood Watch guide, which ensures that they are sustainable choices that promote ocean health. Good food aside, the scene is relaxed and romantic. A healthy mixture of locals, tourists, honeymooners and cyclists from the nearby Marin headlands wander the grounds. We stayed at a different place, the Inn Above Tide in Sausalito (also a wonderful find! ), but Farley Bar was the perfect interlude between a day of hiking and a full course dinner in town that night.